I am planning my official book launch in two weeks. Talk about freaked out! I called it a cocktails and book launch party…but it’s more like a an all-girls get together. We’re going to be dishing all about relationships, men and love so I thought it would be fun. I’m releasing it as an e-book although I will have the printed option will be available. I had the most difficult time figuring out how I was going to do a book launch with no “physical” book, but I know it’s been done before. I’ve always marched to beat of my own drum and love the idea of doing things just a little bit differently and this occasion is no exception. For example, where most people have book launches to sell their books, I’m having this party only to promote it. I have a whole universe I’m creating around the concept of relationshipDNA and the book is only a small piece of it. I’ve been searching for a couple of ideas on how to go about this unorthodox book launch and was very surprised to find there weren’t too many ideas or inspirations I could choose from (go figure wierdo!) None-the-less, I found a couple of ideas and have come up with a few on my own to make this an unforgettable and fantastic event. The place I’m renting looks pretty loungy and well decorated on its own. It’s a swanky condo club room I got for free since I know the person that lives there. Score!! Since the subject of my book is about love and relationships I was thinking of adding a few decorations of hearts, perhaps some hanging from a ceiling and add a few red roses throughout. I’ll do it with a delicate hand. Don’t want it looking like a Valentines dance gone wrong. I’ll set he mood with a mix of jazz, r&b and soul love music…none of that bedroom stuff. Just popular joints they can all sing to. Since there won’t be an actual book, I’ll have to show the book on something!! Enter my new Kindle Fire. I’ll have it set on my special book table along side the over blown image cover of my book (which I designed myself, and looks great by the way!) I’ll post a photo in my next entry. Food: definitely want to have some red cocktail options. pepper in some non-alcoholic and that will cover that. I’ll keep it simple with Finger foods and a nice fruit and dessert table so they can serve themselves without too much trouble. I was thinking of having a cake with he image of the book on it, but I’m afraid no one will eat it. Everyone’s watching their figure these days. What’s with that? Perhaps I’ll do cupcakes instead. The weight watchers and health snobs can wrap heir minds and mouths around that. No offense Nubia!! Do you, it works! X-D! I’m not yet sure if I’ll be doing an ‘official’ reading…maybe I will depending on the mood, but I definitely want to add some kind of interactivity to the equation. I will first talk a little bit about the book and then open myself up to a question and answer session. Then, since my book is all about relationships and making it work, I will be asking the guests as they enter and mingle to write down questions they’d like answered about relationships and ask others to answer some questions I’ve already written down. and the other I’ll call He Put A Ring On It (for the married or engaged women). I worry that it may make some people feel a little uncomfortable, so those who want to sit out, can. I will ask the ladies what challenges they feel they experience in love and relationships and I will give my thoughts. Then I’ll open the session up to both the single and married women, where the married women can answer the single ladies’ questions from their experience. This game is intended for the single ladies to learn a few things from the married women about what they’ve learned about love, men and successful relationships and marriage. I hope this works out in reality the way I think it will work in my head. If any of you have a suggestion or see a flaw in here somewhere, please point it out. To encourage participation, I will have a great incentive. I plan on giving the new kindle fire away as a grand prize. The more you participate, the more chances you get to win through raffle tickets. An on second thought, I may order a few physical book printed up and make them give aways as autographed copies. So that’s my book launch party plan. 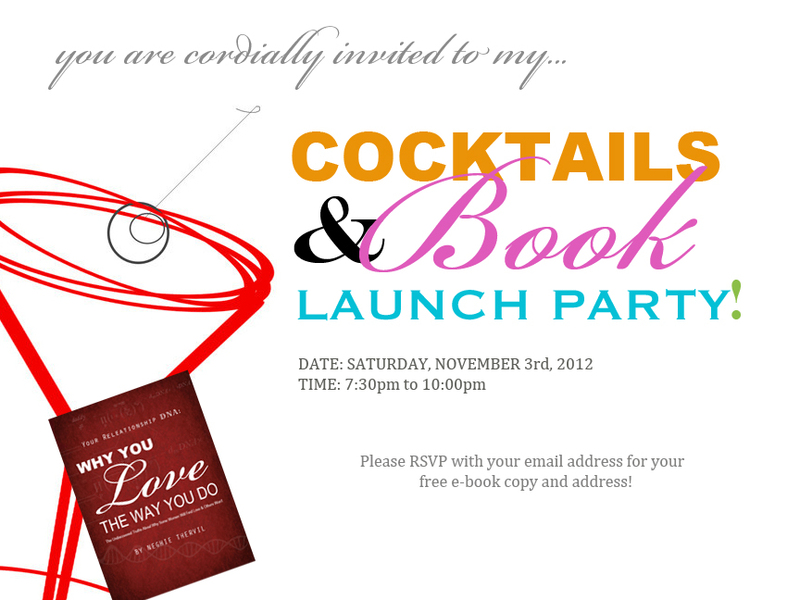 Already sent out the invites (I designed that too!) I want it to be fun, memorable and I might want to make it a recurring event. We girls are always making an excuse to get together and have fun. Why not do it for love! Will take lots of photos for your viewing pleasure. Until next time!! Ahhhhh! The big day is here!